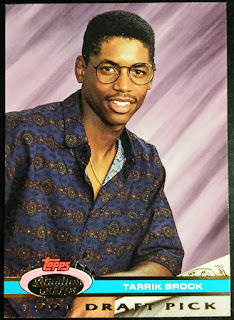 For the past few weeks, I've been using the popular social media phenomenon known as #ThrowbackThursday as an excuse to post a series of retrospectives on Cubs players younger days. 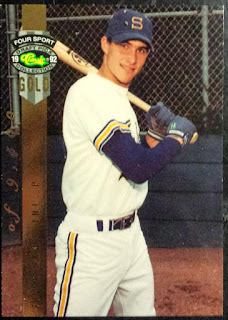 We kicked the series off by looking at their minor league cards, followed by a look back at cards from their time in in the collegiate ranks. Thus, the natural progression leads us back even further, to the time many a burnout would declare their "glory days"
I, of course, am talking about their time spent in high school - the days of honors biology, awkward parties and attempting to bribe creepy old men to purchase alcohol for them. Ahhhh, good times, good times. I'm just going to go ahead and acknowledge the elephant in the room and state that Classic Four Sport is a brand that's going to make up a majority of this post. After all, this sort of thing was kind of their specialty. 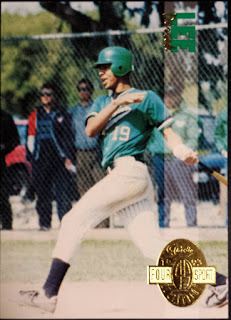 Here we have one in a long line of good Cubs first basemen in Derrek Lee, way back when he was swinging the stick for the El Camino Fundamental HS Eagles in California. Nothing screams high school athletics quite like a chain link fence, some mulling about in windbreakers and a parking lot in the background. You can see the powerstroke in that swing, even then. Next up, we have a guy whose Cubs tenure was much shorter than D-Lee in Ben Grieve, who had a couple of brief stints in 2004-05. Well before that, he was swinging a heavy stick with the James W. Martin HS Warriors in Texas. That's quite the crowd for a high school baseball game. 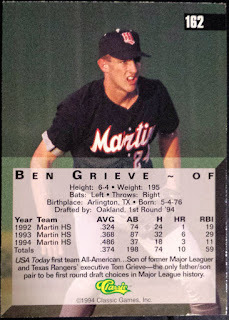 Although, since he was drafted second overall in the 1994 draft by the Oakland Athletics, he must have been worth the price of admission for local sports fans. It's a much clearer view of his jersey - a quality that I find very important in my pre-rookie baseball cards. Pitcher at the plate alert! 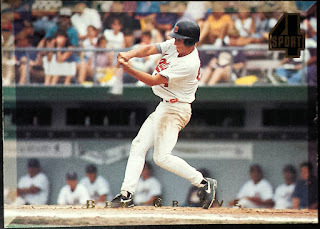 The former Serra HS Padre (Cali, again) was drafted in the first round of the 1992 draft by the Twins for his abilities on the mound, rather than his skills at the dish. He never did fulfill that potential, bouncing around the league in brief spurts (with Cubs in 1999) until 2007, with a few stints in Japan and Mexico mixed in. He must have played out of sheer love of the game though - he was still active in independent/foreign league as late as 2013. However, all I can think of when I see this card is "wow, that looks like a Seattle Pilots uniform." Additionally, check out that very 90's serial number; one of 9,000+? Soooooo limited! 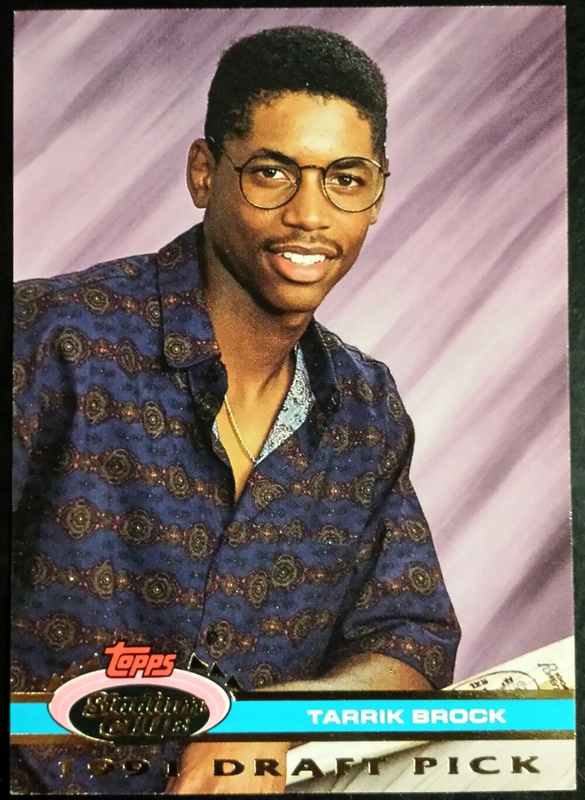 Here's the last high school image I was able to dig up and what a one to close out with; Tarrik Brock's glamour shot is a real winner, especially thanks to that lovely button-up! I'm sure this image also graced his Hawthorne HS (Cali x3) yearbook, surely with some "clever" inspirational quote underneath. 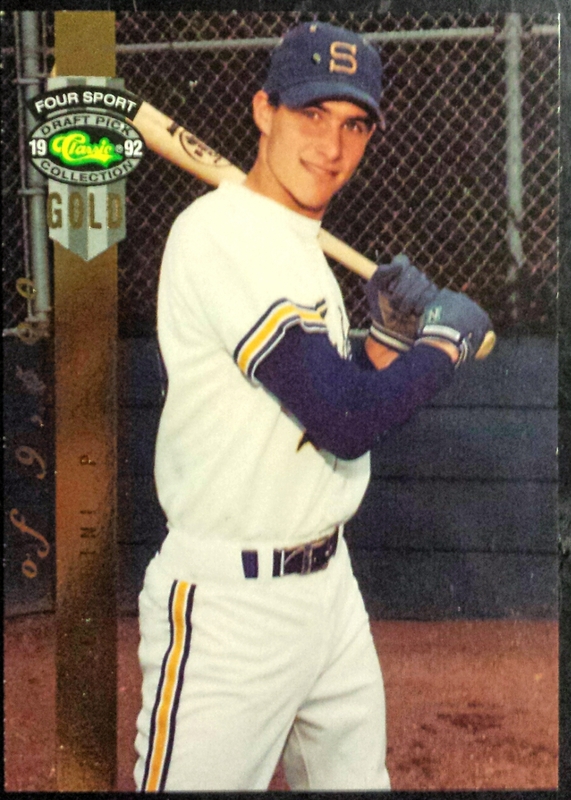 Couldn't Topps have, at least, used a picture of his playing baseball with the Cougars? For that matter, all of these SC cards would have looked much better with actual baseball photos. Tarrik (no relation to Lou) played in the minors for many years (1991-2003), getting one cuppacoffee with the Cubbies for the opening of the 2000 season. 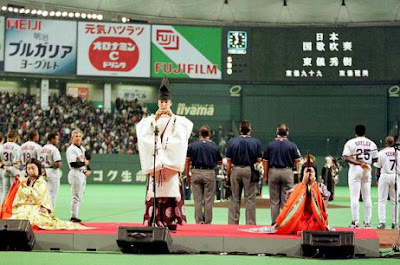 As such, he got to play in the first MLB game played in Japan, since Chicago opened their season against the Mets at the Tokyo Dome. 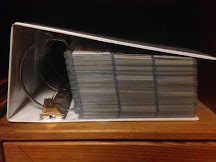 And that is the extent of my Cubs high school cards; unsurprisingly, I didn't have all that many to choose from, seeing as they went on to bigger and better things. Maybe next week we'll take this concept back even further and see if I have any cards that depict Cubbies as little leaguers. I know a few sets have been produced with that concept in mind; I may have a few of them too. Thanks for throwin' it back, high school style, with me this week. Although, I suspect most of us spent more time "throwin' 'em back" during those four years than building prospect status. Fun post! As a high school baseball coach I can't agree more about chain link fence, parking lots, and wind breakers.